Wouldn't the simple solution be to make the rooms 30x30x10? Or maybe there is a solid 20 foot ladder lying in the room. Or maybe the designers don't mind that there will be a 20 foot drop when the room is upside down. After all, they don't mind the difficulties of S2. 8' high doors, 10' high ceiling, 1' each for lintel and sill. And when flipped 90 degrees, hey, trap doors. I just watched some movies where this was the plot of the story where a group of people were imprisoned in a shifting and trapped group of rooms or "cubes" and needed to escape. they are all on netflix the original you'll have to get the dvd or find it on megavideo the other two are on instant play. Thanks all. Very helpful. I think I have two competing goals here 1) to make these four configurations feel fairly natural, i.e. not stand out as weird because they are in a turning dungeon and 2) make a dungeon easy for players to map and visualize. I'm still thinking of the best compromise of the two. I think, oddly enough, that it might be my initial thought of tiered steps. @David: Thanks, I've seen the first two mentioned and liked them, but I think they are pretty squarely in the camp of screw the players by confounding them. They are in effect 3d mazes. I'm more interested in a dungeon that becomes a different and interesting dungeon each time you rotate it. I think this is much more difficult and I'm still trying to work out how in fact to do it. Regarding the edit, I don't see a problem with having the 10' openings 10' off the ground. It gives enough of a hint that something is weird about the place, but not anything too obvious. Leave it up to the players ingenuity with ropes and boost-ups to get from room to pasage! How fast is the moment of rotation when it happens? If you're in the long corridor do you have time to get to a room, fix grapnels, set up a web of ropes? That would be my non-magical way of keeping stuff safe, BTW: make a web in the centre of a room that big heavy balls and liquids and such can go around. And this is the perfect dungeon to be kept clean by gelatinous cubes, which might not even have to be able to move on their own at all: they'd be plenty terrifying just sliding toward you uncontrolled. ...the more I think about this, the more I like it. "That's funny, one of the walls in this corridor is wet." Tide pool creatures and shellfish in the corners - anemones in particular might look like jellies or similar when closed, and might contain treasures you can only get when they're submerged. I would still insist on having some kind of twisty giant marble run in here for Indiana Jones style chasing, maybe in the undercaverns of a coral forest. Yes it's a topographical nightmare that the players could never map, but then, they'd be too busy running and jumping. @richardthinks: I'd envisioned it rotating slowly enough as to not be dangerous, but not so slow as to allow players to just get the heck out of Dodge. I don't know, maybe a turn? I'm still really intrigued by the idea too, but it would be really hard to describe some configurations to players, or even keep track for myself, that's where I left off. Still thinking on that. Interesting. 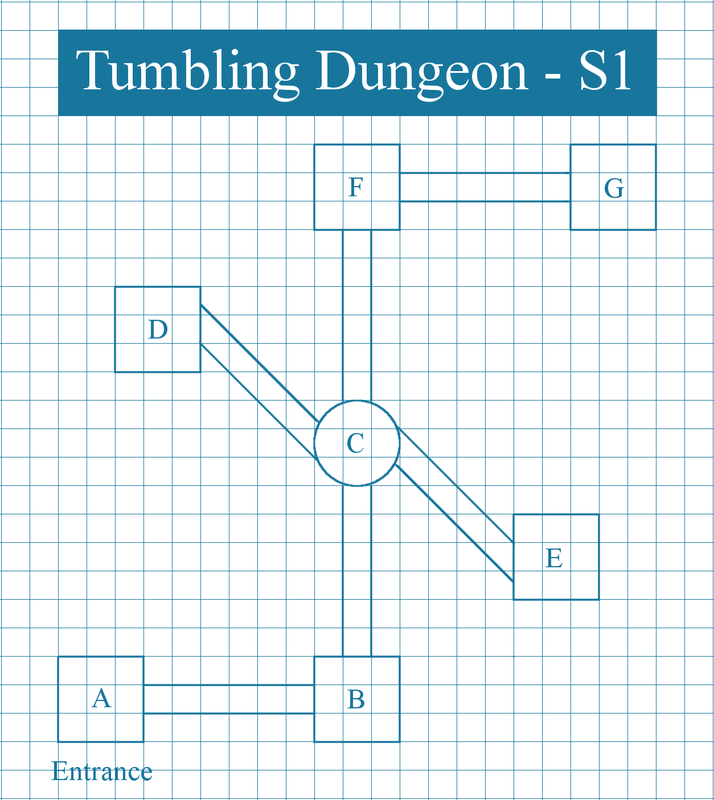 The dungeon rotates around an axis passing horizontally through "C". 2.) The juncture can be set at one point (wall center, corner, center line of floor/wall junction) and room rotates in sync with the rest of the dungeon. At times the corridor/room juncture is easy and them becomes difficult and dangerous. 3.) 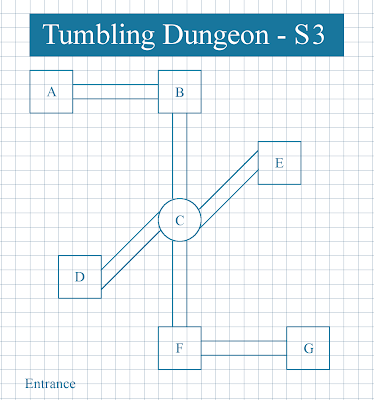 The dungeon does not need to rotate, only the gravity force. 4.) 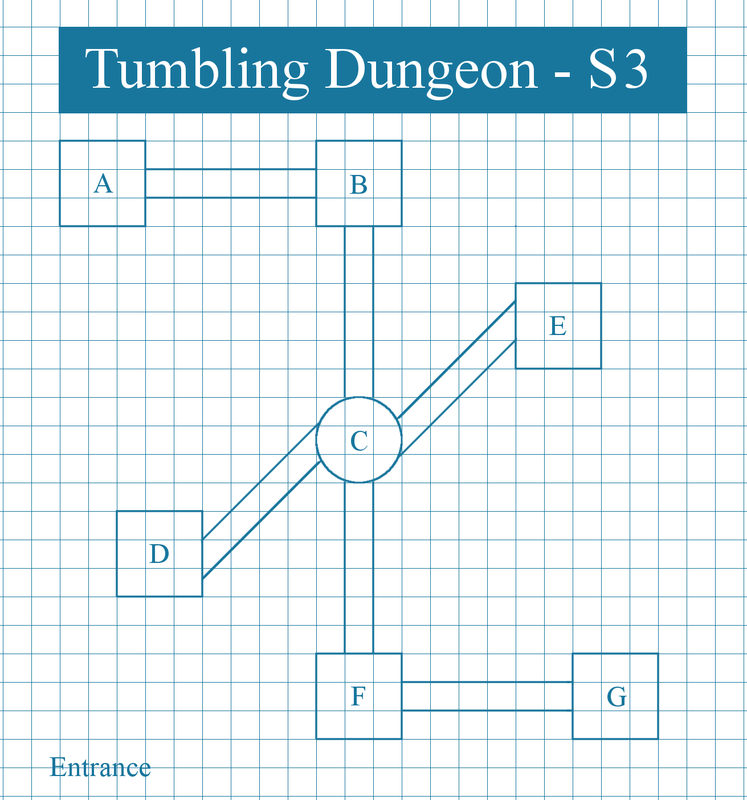 If the dungeon rotates with sufficient speed one 'walk' the walls in the outer arms of FG & AB and tumble in the D:E arms. 5.) Is the FCB arm offset in like manner as the DCE arms? Would make for a nasty fall. I don't know if I'm too late for this, but for doors you could use 10-ft wide gaps in the wall from floor to ceiling. That way, at any rotation it's accessible from the floor, and it gives a clue to the nature of the dungeon which is obvious in hindsight, but in the mean-time it just looks like a really tall door.